Over 100 Dulux Group workers have begun an indefinite strike in Brisbane, following a refusal to remove caps on redundancy and sick leave pay-outs for sacked workers. AAP reports that Dulux will cut 40 jobs at Rocklea, in Brisbane’s south, as it restructures its operations and opens a new site in Melbourne's north. 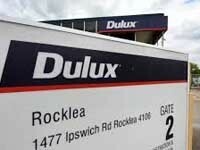 Dulux states that it will keep over 70 per cent of the 150 jobs at Rocklea. The Rocklea factory will focus on making solvent-based decorative paints when it opens the new site late next year. The site is the company's main decorative paint site and includes its state distribution centre. Worker Tony Dickson said that the company’s profits grew significantly to $124.7 million last year, and it should be able “to treat us fairly," he told AAP. Dulux said in a statement that it had been planning for the indefinite strike action, and had "robust contingency plans" in place, including in its distribution network and stock levels. The Melbourne site will make nearly all the company’s water-based decorative paints, which are currently manufactured at the Rocklea factory.